This issue occurs due to changes to the web browser containing a fix to combat an unrelated vulnerability that consequently disables certain SSL Ciphers. When I was looking for how to avoid this for web client or any other site giving this error, I came across the thread about the related issue on Google Chrome Help Forum and the summary is, so far Chrome itself doesn't have any option to disable related setting to allow the sites having relatively week security. 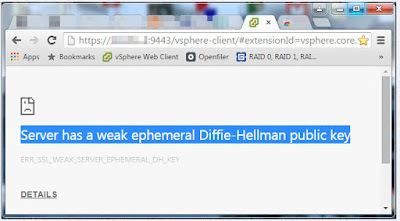 If a secure website gets the error ERR_SSL_WEAK_SERVER_EPHEMERAL_DH_KEY, it means the website is trying to set up a secure connection, but it is actually IN-secure because the SSL/TLS uses a Diffie-Hellman group size smaller than 1024-bit. 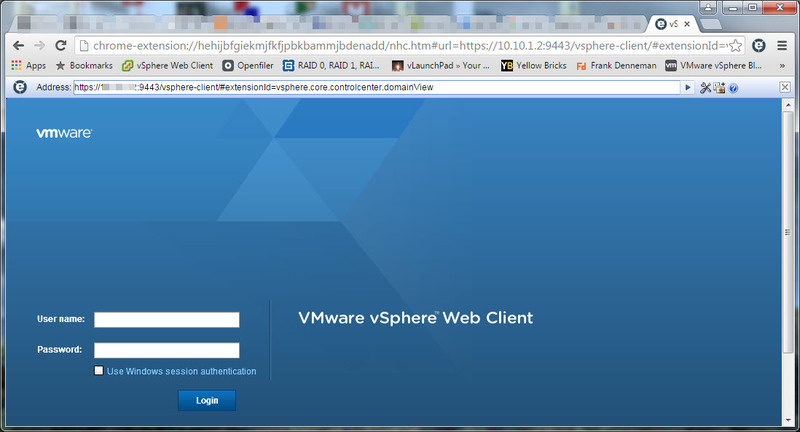 In this case, the website/webserver needs to be fixed. Google Chrome won't use insecure connections in order to protect your privacy. In my case I am using self signed certificate instead of certificate authority signed certificate. 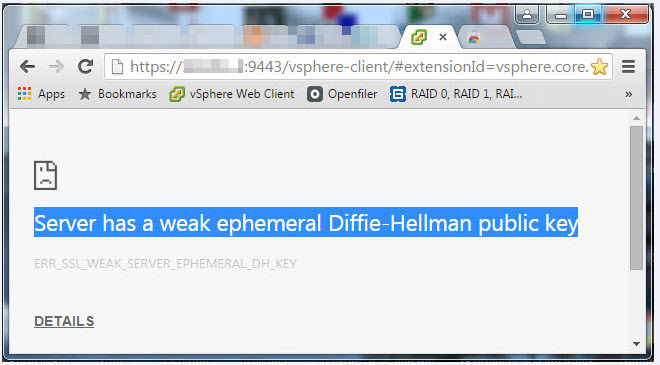 Resolution:- Google Chrome:- As I earlier said the there is no option available within Chrome to enable you to access less secure sites over https however as a way around we can use IE Tab Chrome Extension it will allows us to open vSphere web client within Chrome. Though it's not an official fix, it still works and would allow you view the web pages without any issues. By default, these are set to TRUE. But you have to set them to FALSE in order to allow the less secured pages. 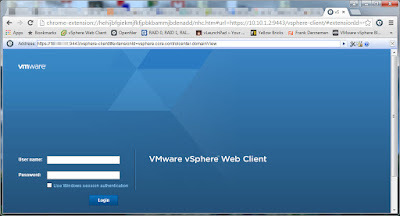 Reference: kb# 2125607, Senthil Kumar Murugesan's blog.